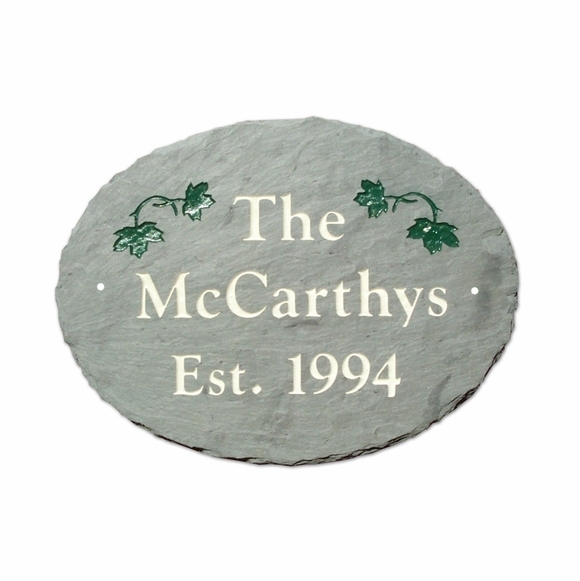 Personalized Slate Established Date Wall Sign - - green oval sign with white lettering and green leaves. Made in USA. Although we call this an "Established Date" sign, feel free to personalize it with any wording you want. Two sizes: 12"W x 9"H and 14"W x 10"H.
Line 1 holds up to three (3) characters (including spaces). Line 3 holds up to ten (10) characters (including spaces). On the 12" x 9" sign, characters are 1" high. On the 14" x 10" sign, characters are 1.25" high.